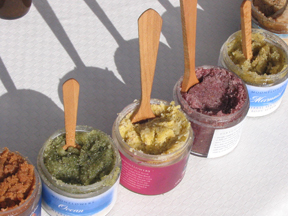 Since regular exfoliation of old and tired skin is a big part of skin care, Di and Melanie have spent a lot of time developing these salt, sugar and dry scrub formulas. 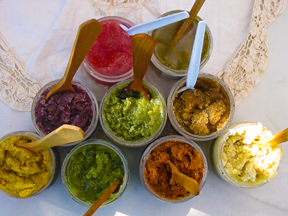 Just check the ingredients – top tier food grade oils and butters, organic sugar and sea salt, lots of farmstead herbs and coast seaweed and tons of love! 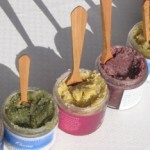 Di makes scrubs seasonally, as differents fruits and herbs become available. Remember – WE ONLY DO FRESH! Made with: Raw cane sugar, elderflowers, apricot, sunflower, olive, jojoba & grape seed oils, shea & cocoa butter, Dillon Beach seaweed, jasmine wax & essential oils. Made with: Organic sugar, sunflower, grapeseed, olive, coconut & jojoba oils, shea, cocoa & almond butters, fresh local Meyer lemons & essential oils. Made with: Organic sugar, sunflower, grapeseed, lavender, olive, coconut & jojoba oils, shea, cocoa & almond butters, dried Tomales lavender & Tomales lavender essential oils. Made with: Sea salts, grape-seed, hazelnut & olive oils, shea & coconut butters, rosemary & St. John’s wort oils, seaweeds harvested on the Marin coast and blended with pure essential oils. Made with: Sea salts, grape-seed, hazelnut & olive oils, shea & coconut butters, chamomile, St. John’s wort & calendula oils, liquid amber, herbs of calendula, chamomile & elderflowers & pure essential oils.